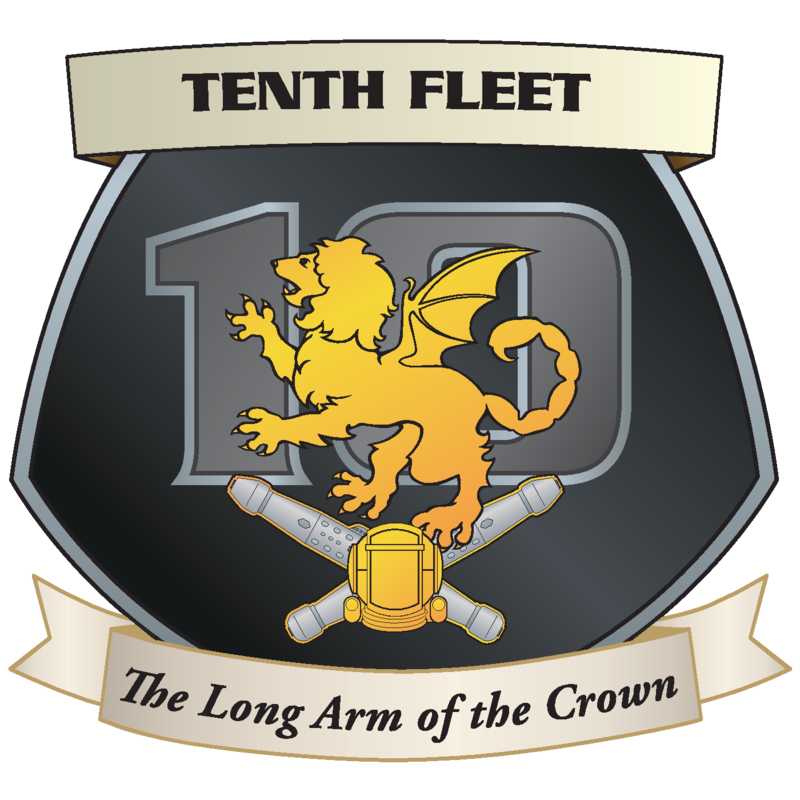 Rear Admiral of the Red Sir James Jones, GCE, CR, SC, OG, CGM, GS, QBM, CBM, RMN, is the Commanding Officer of Tenth Fleet, and has been since his appointment by the First Space Lord in January of 2018. As commanding officer, his duties include the oversight and execution of Fleet and TRMN policy. He acts as the fleet’s representative to the First Space Lord in all matters involving the overall organization. His flagship is HMS Thunderer (SD-323). Commodore Jenni Merrifield, OE, DSO, CBM, GSN, is the Deputy Commanding Officer (DCO) of Tenth Fleet. She was appointed to this position in January of 2018. As DCO, she is the second-in-command of Tenth Fleet. 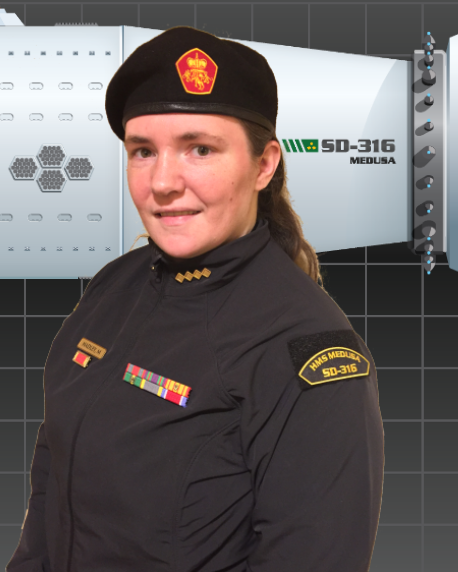 Her primary duty is to act as the Fleet Commander’s first assistant in command and control of the Fleet, and monitors compliance with all command policies and priorities. She may act on behalf of the Fleet when directed to do so by the Fleet Commander or higher authority. She works closely with the Fleet Chief of Staff on hiring practices and ensuring that the Headquarters Staff has the best possible personnel. Commodore Merrifield serves aboard her flagship, HMS Callisto. Fleet Senior Master Chief Petty Officer William Cain III, OC, QBM, is the senior enlisted advisor within Tenth Fleet. His responsibilities include encouraging the fleet’s enlisted corps in participation, to train and educate new chapter bosuns, and representing the enlisted of all fleet chapters to TRMN Command. In addition to his capacity as FSMCPO, he serves as the Bosun of GNS Randolph Candless (BC-56). Captain (jg) Dale Imbleau, ME, GS, QBM, RMN is the Chief of Staff for Tenth Fleet. His duties include overseeing the successful execution of all command policies within the Fleet, acts as a buffer between the Fleet Commander/Deputy Fleet Commander and the Fleet Headquarters Staff. He works behind-the-scenes, resolves any and all issues possible prior to escalation, mediates disputes, and is a senior advisor to the Fleet Commander. He works very closely with the Deputy Fleet Commander in all hiring requirements, and the Flag Lieutenant to the Fleet Commander to ensure scheduling and timely responses to all fleet matters. In addition to these duties, Captain Imbleau serves as the Commanding Officer of Battlecruiser Division 962, and HMS Black Rose (BC-520). Commander Dame Melissa Comeau, KE, serves as the Fleet Intelligence Officer for the Tenth Fleet. She is tasked with coordinating all Special Projects and to act as the primary liaison to other Fleets/Commands/Admiralty House in coordinating Special Projects and Events outside the Fleet Area of Responsibility where Fleet personnel may be required. Commander Comeau currently serves as the Executive Officer aboard HMS Medusa (SD-316). This position is VACANT. The Fleet Operations Officer for Tenth Fleet is tasked with overseeing all initial inquiries into launching Pinnaces and Light Attack Craft within Tenth Fleet for initial approval and coordination with the Bureau of Ships prior to seeking the approval of the Commanding Officer and Chief of Staff. Captain Ote MacOdo, GSN, is the Fleet Communications Officer and is primarily responsible for the design, construction, and publication of the Fleet’s periodical newsletter. He is the Commanding Officer of GNS Randolph Candless (BC-56). This site's original content is released under the Creative Commons BY-NC-SA 4.0 license. For our policy on content usage on other sites, please visit this page.